An air conditioner works more efficiently and effectively when it is clean . By cleaning your air conditioner you will make it cheaper to keep your house feeling cooler. Cleaning the filter is the easiest part to do. It is advisable to take off the front panel from your unit, as sometimes dust gets around the filter and needs to be cleaned out as well. If you have a window unit it can be very simple to clean. A door may open or the filter could slide out sideways. You can clean some air conditioners with water, but other ones just use a vacuum to clean it. You will be able to tell by the material of the filter. For a central AC the filter should be in your actual furnace unit. Some filters are washable and last for five to ten years but still need to be cleaned every 30 days to three months depending on the make of the filter. The external unit typically just needs to have its veins cleaned but you should have an air conditioning technician clean and service your air conditioner every few years to maintain top performance. 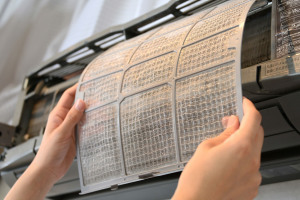 If you want to clean a large air conditioner unit, you should look up the manual on the specific model and find where the filter or filters are located. Clean your air conditioner and make it cheaper to run in your home. Take the time to clean your conditioning system properly to get the best performance. Clean the filter and take off the front panel, as sometimes dust clogs up the filter and needs to be cleaned out as well. If you want to clean a large sized conditioning unit, you should find the manual for the specific model and pin point where the filter or filters are located. Buying A New Air Conditioner Can Be Easier Than You Think! 10 easy ways to reduce your air conditioning running costs now! Be Careful While Purchasing Cheap Aircon Units Online!